Stay on top of your game at Senara Men’s Health Center. 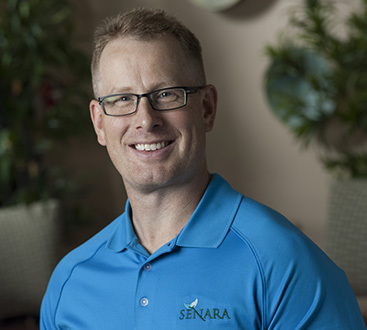 Welcome to Senara Men’s Health Center, a division of Senara Health and Healing, in Peoria, IL. Founded from the principles of our Live Life Well mantra, we are dedicated to improving men’s health and vitality. Using the latest technological advancements and proven treatments, we customize a solution for your unique needs. The Senara team of medical professionals specialize in treatments to improve sexual health. At the leadership of Dr. Keith Kramer, we will help you get back in the game. Or, simply improve your game. We offer a variety of non-invasive and minimally invasive options for treating erectile dysfunction, low testosterone, and low libido. Treatment is safe, convenient, and discreet. Options include: GainsWave® (Extracorporeal Shock Wave Therapy), the Priapus Shot (P-shot) with PRP, IV Therapy, and BioIdentical Hormone Replacement Therapy (BHRT). Age is just a number. So why not feel, look, and perform as vibrantly as you did in your 20s? Senara Men’s Health Center in Peoria, IL is your one-stop destination to rejuvenate, relax, and restore, so you can conquer life.